Motions detectors are those convenient and must have devices that detect moving things or objects which are in live motion, especially humans. Motion detectors are very efficient especially when they are integrated with LED lights which are one of the best and effective ways to maintain not only your security and also a pleasant environment, because if they come with sound or alarm system then the purpose for that would simply be: A burglar alarm. Motion sensor lights are the ultimate security gadgets in the market against petty prowlers and trespassers. This is the new fail safe equipment which is used to scare away thieves and other people who even mistakenly lurk on your property. The main areas where you can use these Motion sensor lights are on the external areas of your property, such as your garden or your patio and backyard, near your garage. Motion detecting lights normally come in LED nowadays and can be both wireless and wired, however wireless lights have much preference by the general consumer. We will rate all the best under 100 dollars LED motion sensor lights and rate them on their security, their automatic light control systems and energy efficiency. These will be the primary areas and the secondary will be convenience, power time, design and looks, pricing and installation ease. Great outdoor light Provides up to 12 hours of continuous lighting after sunset. Solar panel life span: 5 years – LED Life Span – 50000 hours. 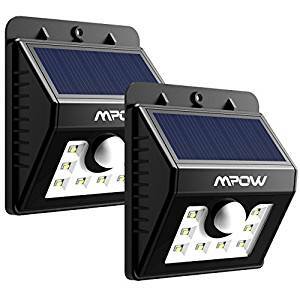 Security: In security ratings these URPOWER Solar Lights get a 10/10, not only did we find excellent reviews about them on Amazon but the general public has a great liking to them. It gets a 10 from us because it comes with a Motion Sensor which can detect up to 3 meters and has 120 degree detection range. Automatic Light Controls: At the same time it has a very nice automated light control mechanism which has a very strong night sensor of 10 Lux Auto which has an inbuilt capacity to differentiate between night and day. 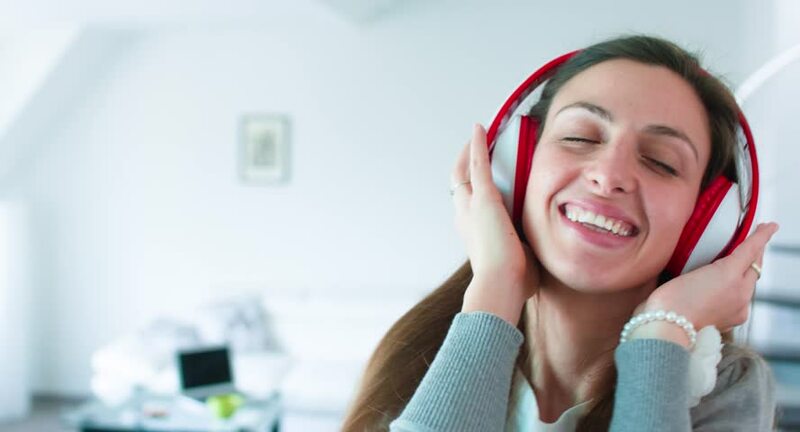 Energy Efficiency: Takes roughly between 7 – 9 hours to charge fully so it’s great even when there are power outages and other electrical disruptions. Convenience: It installs very easily and within seconds plus it has an automated switch which is more than generous from the manufacturers. Design: They are designed very sleek with an angular almost triangle shape with lights in the bottom and detector at the top, which makes it look very cool. Price: At under 40 dollars, these motion sensor LED lights are a steal. A worthy bargain if there was any! These can be a great security solution for those petty nightmares of yours, a luxury security product to have ensuring you don’t get unwanted people near your house or place within a proximity of 10 feet or so. They look fancy, hence can be a great decorum addition to any unwanted site or place in your house or shed or any place extremities. The sensor on these lights is really awesome and you can relax and put your mind at ease. There have been no reports of malfunctioning or any of the sort in these from any of the reviews we sifted through. They score a perfect 5 star on energy efficiency since only after 7 – 9 hours of charging they can run on and on and on. They install within seconds so that’s a big bonus with these motion detecting led lights. They are wireless, which is another plus at the same time. They provide at least 12 hours of continuous light tested by many users and has a lifespan of approximately 5 years. Design is awesome and at under 40 dollars they are a must have, an absolute combo! Get it! Security: As far as security is concerned these are your personal night watch men, these LEDs come with motion detectors which have a range of more than 25 feet. So you can be sure that no one will ever dare to be near your home or any area where you don’t want them to be. 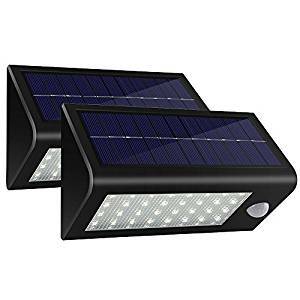 These LED outdoor motion sensor solar lights are an awesome set of product with 24 LED lights; this is a packed powerhouse of lightening and brightness. They also have a unique wide design which gives it a very good look. 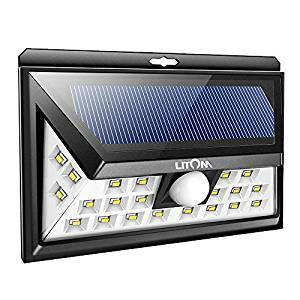 These motion detecting LED lights are solar powered and hence they have a very strong brightness about them which is awesome for any residential or commercial area as well. These LEDS have a very wide range of illumination because of their 3 angles which can reach around 280 degrees. These LED’s work best when install them where they get a good amount of sunshine during most parts of the day. Hence you should keep this in mind when mounting them. Because of their 24 LED design they provide super bright lighting and have technically no comparison in such a price range. Automatic Light Controls (Sensing Range): The sensing motion range on these beauties really packs a punch with tested ranges of up to 26 feet they are your classic motion detector buddies. Although they come with an instruction to mount them at a height of around or between 5 to 6 feet. These lights are also very effective at picking up cars and people walking up to your house. Another key feature on these LEDs is that they have different sensing modes, such as medium light and the main sensor mode, this mainly depends on your need and convenience. This is a practical bonus feature. Energy Efficiency: As mentioned above already, you can choose any of the three modes as per your desire. If you are installing them in your house direct areas such as your front area or back area or around the garden then you should opt for Full mode. Light mode is better for terrace and entry-exit ways..and the final one is good for garage and driveway etc. Convenience: It installs like a dream very simple and convenient. Wires are not required at all so that’s a plus as it will save you all the hassle of getting tangled in wires. It comes with a wall plug and screws which are easy to set up, technically taking less than an hour. These Led lights are really durable and are waterproof, so you need not worry about rain or other water related issues. The manufacturer claims that they are made of high impact ABS stuff, it is highly durable and can withstand tough weathers. Design: Design is really awesome with a wide angle covering 270 degree. It is a beautiful piece of LED light. Some final words on these Solar powered motion detecting LEDs is that they have rave reviews from people over the internet, there are literally thousands of 5 stars rating for these LEDs on Amazon. They have a very good motion detector installed on them. Have a great combination of 24 LEDS. They are wireless and have a good life. Range is also a very important and specific feature of these LEDs plus they are wireless easy to install, and have a 3 mode option for different scenarios. The price at which you are getting these is almost free. Overall a very nice product which is backed by many consumers and us at the same time. Security: This wireless LED motion detector is the ultimate in power, range and looks. First glance at only its image and a person gets sold by just the way it looks. The designers have managed to make it look very beautiful and futuristic. This LED is special in the sense that it has a spotlight sort of beam and is a powerhouse of 140 lumens. At the same time these dome shaped heads are adjustable so you can move them around and focus them in whichever direction you want. Automatic Light Controls (Sensing Range): The motion detection range on these babies is a whopping 30 feet, talk about that! One of the smart features on these LEDs is that they have a very nice motion sense. Motion sense is a joke if you don’t talk about technology that is, anyways, the light turns on when it detects motion and turns back off automatically within half a minute if there is no motion. Energy Efficiency: The manufacturer claims that they will provide 365 days of light with each set of batteries and the range is between 10 – 12 times on/off per day. Pretty good at the price they are being sold at. Convenience: Install the wireless LED spotlight in less than 5 minutes with the included mounting hardware anywhere light is needed, including doorways, garages, backyards, porches, decks, fences and trees. Design: The design on these LEDs is awesome, by far the best, they get a 11/10 for their sleek design and awesome shape, plus the head comes with a very tight seal which safeguards the lights and its machinery, the manufacturer claims it as weather tight and says it’s great for all seasons. Guess we have to take their word for it. Apparently they do look very tough indeed. 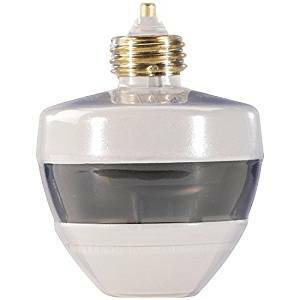 These motion detecting LEDs also pivot up and down as per the user needs and come with screws which makes the installation very easy. People have literally uploaded videos about their installation time with synchronized watches. Price: They come in a pack of 3 and are just a little under 45 dollars. Given their sophistication and commendable reviews over the internet these LEDs are a bargain for sure. You would be glad you stumbled upon them. Overall they get a 5/5 as we found nearly thousands of positive and 5 star reviews about these motion detecting lights and couldn’t help but add them to our list of awesome products under 100 dollars. First Alert has succeeded in making one of the most popular and efficient motion sensing light sockets available in the market right now. It comes with a variety of useful features and there are reams of customers who wish to make this product a part of their household security system. It is the best in terms of quality and is durable as well as visually appealing. Believe it, you will not be disappointed by this product in any way whatsoever. Security: When it comes to security, this motion sensing light is extremely capable. The light in it is hands-free so that it’s switching on and off is automatically controlled when someone enters the room or when they leave. The First Alert motion sensing light is able to detect movement or activity in every direction during both day and night so you do not need to worry about what time it is or whether the circumstances are ideal are not because this product works in all conditions. Movement is also sensed in all planes and has a sensing radius of a complete three hundred and sixty degrees. The height of sensing is also at least twelve feet so you get a wide area of coverage from this product. If you install it correctly, then it has an incredibly high sensitivity and will be able to detect almost all kinds of movement no matter what height or direction it is in. however, it should be kept in mind that this product is only for indoor uses and should not be re-purposed elsewhere. Energy Efficiency: This product is also energy efficient. It can work with incandescent bulbs that are up to a hundred watts. You can also use compact fluorescent bulbs that are up to fifty watts. It depends on your preference. It is very easy to install this light and you will not have to face any additional hassles, simple place it into any pre-existing light socket that you may find in the room where you want to install it. Design: This motion sensing light also has an aesthetically pleasing design. It is white in color which gives a modern look and does not clash with the rest of the décor of the room. The First Alert motion sensing device is reasonably priced, costing less than twenty dollars for one. So do not hesitate and go out and get yours now. 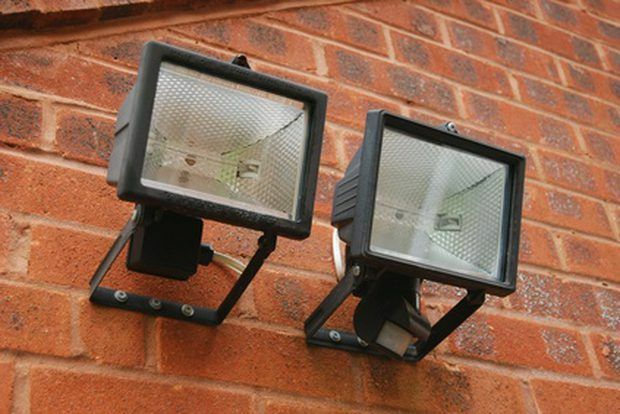 Outdoor security lighting is a useful and necessary measure that should be taken by people. It is important that our security is ensured at all times which is why Hallomall has decided to come up with the best possible product as a solution to this problem. This motion sensing light is one of the most sought-after products available in the market because it has a multitude of enticing features and is a beneficial addition to any residence. Security: In terms of security, this is the ultimate product for you. The lights are 32 LED and around 400 Lumens which guarantees extreme brightness. This is enough to light up any large area no matter how dark it is and transform it into a generously illuminated space. This sort of lighting proves to be more intense and bright than the usual solar lights that are generally available. The range and scope of detection is higher than most others as it is more than five meters in height and four meters in width. This is wide and will be able to detect almost all forms of movement in the general area. There are three intelligent modes for you to choose from. First of these is the light control mode in which the light automatically turns on with a semi-bright light in a dim environment. It also automatically switches off during the daytime. Then there is the motion sensor plus the dim light which keeps a dim light on throughout the night when no movement is detected. Lastly there is the option of only the motion sensor which powers off when there is no movement sensed. Energy Efficiency: This product comes with a large solar panel that works with 5.5 volts which charges quicker even when the sunlight is not very bright. Energy efficiency is also further improved by the lithium batteries which allow the device to function for long periods even during the nighttime. The Hallomall security light has been waterproofed and tight-sealed for your convenience so that you can use it even during harsh weather conditions such as rain. It comes with a 30 day money back guarantee which is ideal as you can use the product and if you are not satisfied with the service then you can return it, no questions asked. The warranty is of eighteen months as well so you are secure when you purchase it. With its affordable and reasonable price and appealing design, this product is a must-buy. If you live in concern of inadequate security and lighting for your residence, look no further. Mpow has now introduced a security light with motion sensing features that will rid you of all your fears and give you an efficient service with no issues to face. With its vast array of beneficial features no customer will be unsatisfied with this product. You will find this to be a greatly profitable investment as its efficient service and excellent quality make it worth its cost. Security: You no longer need to lose sleep over improper security in your area. This product comes with motion sensor lights that are solar and power on automatically once it goes dark at dusk. They also automatically switch off at sunrise so you do not need to worry about monitoring the device or having to bother with its controls. The security light comes with three smart modes of use that are optional to the user: strong long light mode, dim light sensor mode and strong light sensor mode. You can choose the mode of your preference according to your security needs. Being automatic is highly convenient as you do not have to face the issue of handling the device from time to time. Energy Efficient: Along with top security, this motion sensing security light is also energy efficient. It has the ability to actually convert solar energy into electrical energy so that you can use as much light as you wish without wasting resources or having to pay a steep amount for it. You can illuminate your outdoor area every night without any consequences or hesitation. The solar panel has been updated to charge the battery quicker even if there isn’t extremely bright sunlight during the day. The lights are ultra-bright as the security light comes with eight powerful LEDs that are so bright that they can turn even a dark area into a brilliantly luminous space. This is also good for security as it gives a wide scope of detection. The built-in motion sensor is vital for the product to deliver optimal security and the range of detection is 10-26 feet which is wide-ranged for convenience. This light is however, affected by the temperature of the area especially during colder times. It works in all sorts of weather conditions so you do not need to be concerned whether it is raining or something like that. With its visually appealing black color and affordable price, this is the product that you must buy. We are pretty sure that now you would be in a very comfortable position to make a decision as to which of the LEDs you want to buy, our experts scoured the internet to find some of the best deals on Motion detecting Lights and LEDs. We selected the best money can buy with awesome quality. Our goal will always be to save you the trouble of browsing through thousands of pages and looking for best. We are always here for you!